I have experienced the 5 stages of grief since I heard this news yesterday. First, right after the Wife told me, I denied it. No, this was just the most epic Internet Trololol ever. But too many reputable sites ran the story with pictures and numbers and... So then, Daniel got angry! How can this be? It's one thing that you buy Marvel! But now Star Wars! I got down on my knees and begged, bargained and pleaded with the force, "I will do anything!" Disney, you can buy Marvel, but you can never take my Star Wars! The force remained quiet, so I sank into sarrow. Acceptance. I sat on the couch this morning before work and watched some TV. I saw a commercial for Wreck-it-Ralph. A Disney movie I will be seeing this Friday. I am excited to see this film. It looks really good. You know what else is good? Every Pixar movie. Who owns Pixar? Disney. I also liked the new Tron movie they made and of course I like the Pirates movies. So what am I afraid of? Honestly, I don't know. George Lucas has already whored Star Wars out in every possible way. There is Star Wars everything (including Angry Birds). Let's not even mention Episode I. This has devalued the franchise to me. Everyone should just calm down, it's only Star Wars. What was once sacred and cherished is more of a joke now. Merchandised and marketed and focused on making money. We cannot go back to 1977, so everyone just needs to stop crying. 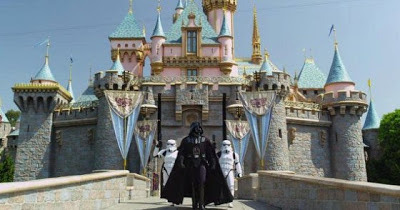 The bright side is that Disney has the money and the power to do what ever they want with Star Wars and do it right! They could give the reins to someone new and they could make something awesome. Have the Marvel movies been bad since Disney took over? Some would argue The Avengers is the best comic movie ever made (not me). Disney helped in that. No, I don't believe we need a new trilogy, but we are getting one. So why not make it as good as possible? What if Disney gave Star Wars to Joss Whedon? Would not the fan boys and girls cry out in joy? What if Disney decided to build an entire theme park in Orlando for Star Wars? Who shall step forth and oppose this? A tired old franchise has been pulled away from the grips of a tired old emperor and just maybe has been given new life. I think it is far too early to panic. I think it is far to early to rage. What if this is the best thing to happen to Star Wars since "I am your father."? As someone who sat in the theater and watched the first movie, I don't believe anything could ever have the same effect on me as that movie. We expect great special effects from every movie now. Back then we had never seen anything like that. I was hooked from the very first moment the movie started!